Labour has the highest proportion of women in its parliamentary party. Its record number of 99 women MPs is the result of using all-women shortlists and the decision to put a majority of women candidates (53%) in winnable seats. So Labour’s conversion rate was higher, despite its poor performance in the polls. 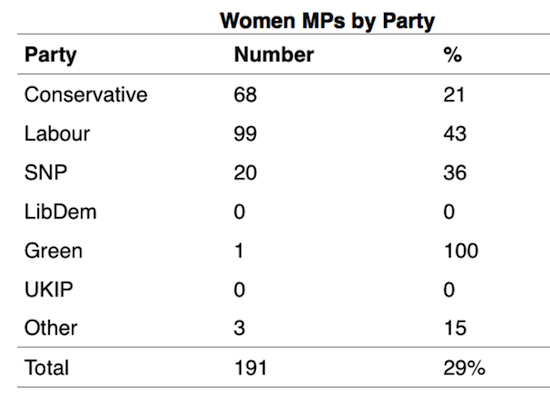 With 26% of women candidates selected, the Tories have 68 women MPs, up from 47 in the last parliament. Although there was no equivalent of the A-List David Cameron used in 2010 to increase the number of women put forward for winnable seats, the Tories did place women in 38% of their retirement seats. One of the key reasons for the increase in the number of women MPs is the performance of the SNP. The Scottish party came second and tied with Labour in terms of the percentage of women candidates selected (34%) and added 20 women MPs to the overall total – as well as the youngest in Mhairi Black. Perhaps surprisingly, given accusations of racism within the party, 6% of UKIP candidates were black or from an ethnic minority group. That’s more than the SNP, the Greens and Plaid. 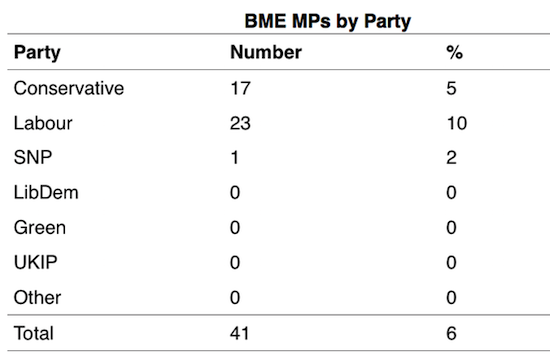 The vote on May 7 saw 41 BME MPs elected to parliament, and increase on 2010 where 27 MPs were elected. MPs from non-white backgrounds make up just 6% of Parliament. Prior to the election, it was suggested that the Conservatives had closed the gap with Labour when it came to the proportion of black and ethnic minority candidates in the running. Our data show that the Tories led the way with 10% of BME candidates selected to stand in 2010, compared to 8% for Labour and LibDems. But this is not the success it seems when you look at winnable seats. While 13% of Labour’s black and ethnic minority candidates were placed in winnable or marginal seats, just 5% of those standing for the Conservatives found themselves in similar positions. Labour had 16 black and ethnic minority MPs in 2010 so the increase to 23 in 2015, despite poor polling, shows the importance of where candidates are placed. The Tories were able to boost BME representation by selecting candidates in very safe retirement seats, including Rishi Sunak in Richmond, Yorkshire – a 44% Tory majority seat – and Suella Fernandes in Fareham, a seat with a 31% majority. The Tories now have 17 black and minority MPs – an increase of six from 2010. The increased diversity in Westminster after the 2015 election is a success worth celebrating, but we should be careful not to lose sight of the big picture. Paxman’s general premise – that there isn’t a great deal of diversity amongst the candidates of the different parties – still holds. Women MPs make up just 29% of the new parliament, that’s less than a third for a country where women make up 51% of the population. It also puts Britain behind many of its European counterparts (Germany, France, Sweden), and well behind countries like Rwanda, Cuba and Kazakhstan. And black and ethnic minority MPs make up just 6% of parliament, despite representing 13% of the population. To put the progress made in perspective, the UK would need to elect 130 more women and double the current number of black and ethnic minority MPs to make its parliament descriptively representative of the population it serves – and the political parties are still not offering enough candidates from these groups in the right places to make that happen. Chrysa Lamprinakou, Marco Morucci, Sally Symington, Sam Sharp and David Ireland also contributed to this article. Jennifer Hudson is Senior Lecturer in Political Behaviour at UCL. Rosie Campbell is Reader in Politics at Birkbeck, University of London. This entry was posted in Parties and politicians and tagged 2015 general election, BME, Conservative, diversity, Green Party, Jennifer Hudson, Labour, PCUK, Rosie Campbell, SNP, UKIP, women. Bookmark the permalink.